Most woman of fashion and beauty know the importance of lip exfoliation and understanding the differences in the best lip scrub products. These lip scrub reviews will teach you what works and what doesn’t, and the strengths and weaknesses of lip exfoliation products in the market today. Learn about the best brands, and read on for lip scrub reviews and tips about the different products. Your lips depend on it! One of the many types of lip scrub that you’ll find these days is the tube-type that functions like a lipstick and a scrub combined. 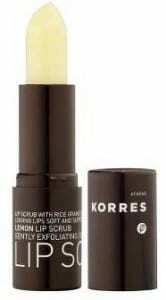 Korres lip scrub is one such type, a lip scrub that you can take on the go and use anytime you want. And that’s probably one of its strongest point. If you travel a lot and need a quick fix all the time, tube types of lip scrub like Korres might be a good pick for you. The product also claims to have no paraben and other harmful chemicals and synthetic fragrances. It promises to effectively exfoliate your lips and make your lipsticks stay longer. The problem with Korres lip scrub however, is that it doesn’t come with directions about proper application so you can have the best possible results. The grainy substance that functions as the exfoliator seems to be buried deep in the solid buttery mixture so that it works more like a lip moisturizer than a lip exfoliator. It might work best if you apply it on your lips, scrub it with your fingers or rub your lips together until the grainy substance dissipates, then wipe it off your lips like usual. Sara Happ Lip Scrub comes in many different flavors such as peppermint, vanilla bean, brown sugar, crème brulee and green apple. 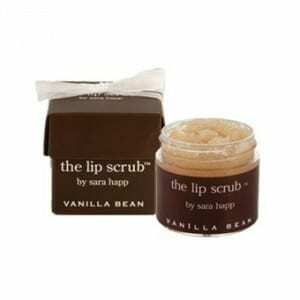 If you prefer simple types of lip scrub, Sara Happ might be the lip scrub product for you. The ingredients used in their lip scrub products are those you might just used for your own DIY lip scrub. It’s a no nonsense lip scrub packaged in a pretty box with a cute ribbon. The grainy exfoliator is large enough to do its job but not too small to make exfoliating difficult. The product also leaves a moisturizing feel and effect after you wiped it off your lips. So, if you want simple types of lip scrub with just the basic ingredients, and yet very effective, pick one from one of the Sara Happ Lip Scrub offerings. The Lush line of lip scrub boasts of many types of lip scrub for the discerning female. There’s the Mint Julips, Bubble Gum and the Sweet Lips. They come in small jars similar to Sara Happ, but at a discounted price point. The different types of lip scrub they have contain pretty much the same exfoliating ingredients. The difference of these types of lip scrub products mostly lies on the flavor, the taste and the aroma of the scrub. Lush types of lip scrub, like Sara Happ, are also very straightforward to use. Just apply them on your lips, scrub it gently in a circular motion, and then wipe it off or rinse it off with water. But unlike Sara Happ types of lip scrub, Lush doesn’t have a wet sand texture and the grainy exfoliator doesn’t stick well with the oily substance in a solid lump of scrub, so that when you use it, some sugary particles fall off and makes it difficult to exfoliate without a mess. The ultimate choice is up to the consumer. With these great products, each individual will have to decide which one fits their needs the best. Hopefully these lip scrub reviews have given you some basics to help you begin the search for the lip scrub product that works best for you.